The Cassini mission ended last year when the out-of-fuel spacecraft plunged into the atmosphere of Saturn. 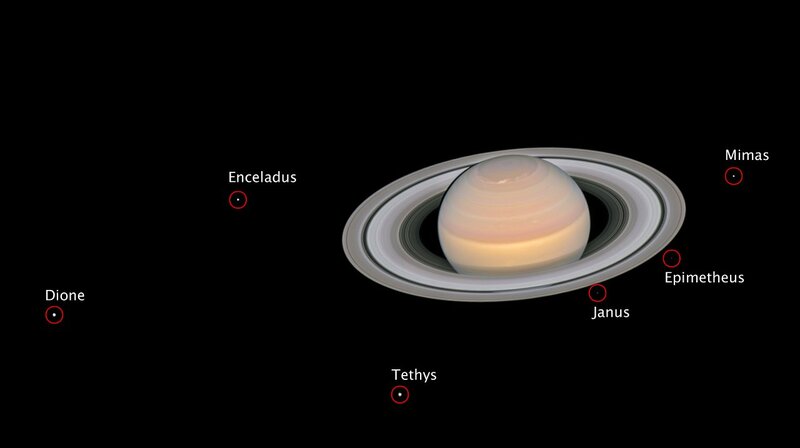 But the Hubble Space Telescope is still providing jaw-dropping views of the ringed planet, including this composite image captured on 6 June showing the fully illuminated world and six of its known moons (left to right: Dione, Enceladus, Tethys, Janus, Epimetheus and Mimas). This Hubble view was taken just before Saturn reached opposition on 27 June when the Sun, Earth and Saturn were in a line with Saturn’s rings seen tilted near maximum as viewed from Earth. A version of this image was posted here on 26 July but did not include the moons. 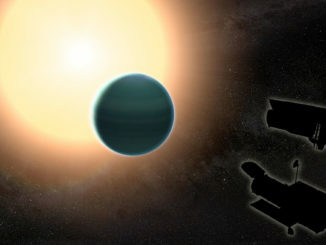 The photo was collected as part of an ongoing study of outer planet atmospheres. Voyager 2 made its closest approach to Saturn 35 years ago — on 25 August 1981. 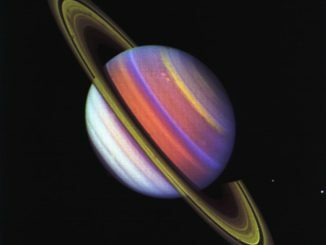 What the Voyagers revealed at the planet was so phenomenal that, just one year later, a joint American and European working group began discussing a mission that would carry on Voyager’s legacy at Saturn. 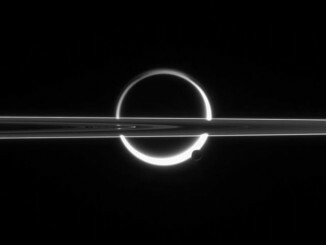 Saturn’s beautiful rings form a striking feature, cutting across this image of two of the planet’s most intriguing moons: Titan (diameter, 3,200 miles) and Enceladus (313 miles). The rings have been a source of mystery since their discovery in 1610 by Galileo Galilei, but there is not full agreement on how they formed.